Our new Middle East Galleries open next week and they will feature over 1200 artifacts from our collection, including many iconic objects like the Ram in the Thicket, the Bull-headed lyre, and Queen Puabi’s headdress. Oh, and for those of you who are always asking about our cuneiform tablets, do we have a treat in store for you – there are dozens and dozens in the galleries. The majority of the objects in the exhibition were excavated by Penn archaeologists, many nearly a century ago. ALL of these objects came through our Conservation Labs to prepare them for the galleries and many needed significant treatment in order to ensure their stability for long-term display. 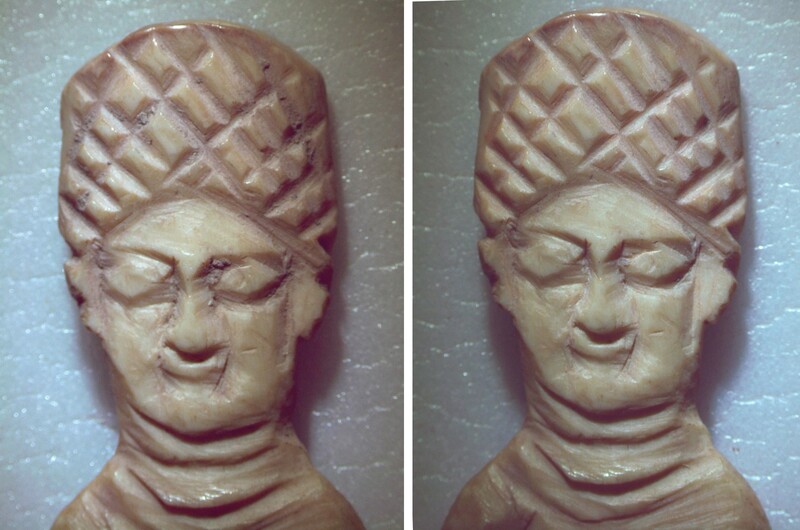 Our Middle East Galleries (MEG) team has worked diligently and tirelessly on this project – you can read more about some aspects of this work on the Penn Museum blog here. 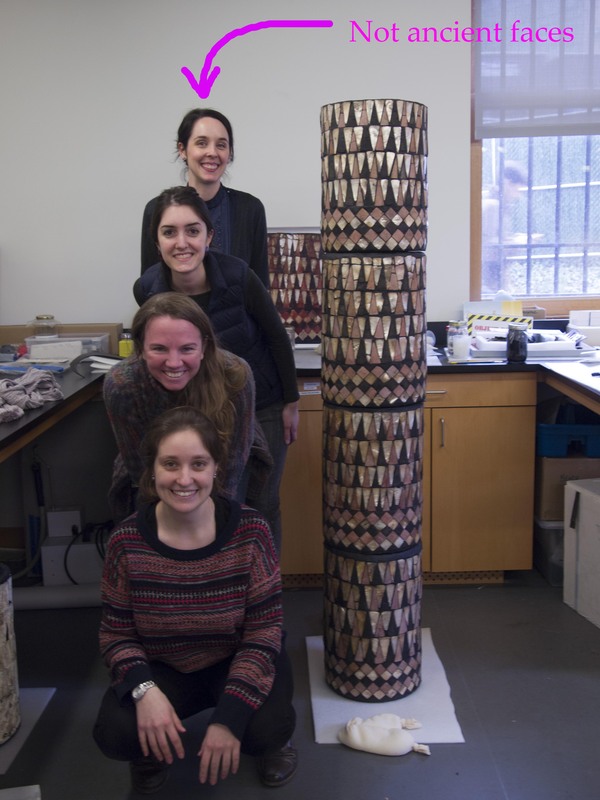 The triumphant column team poses next to the 4 recently conserved mosaic column drums from Tell al-‘Ubaid, Iraq. This project took months to complete. In just over a week, visitors to the Museum will have the opportunity to get up close and personal with these newly-conserved objects. Everyone will be drawn to the highlight pieces mentioned above and here, but the other pieces are worth lingering over too. It’s usually impossible to see them as closely as we do during the conservation treatment process, so I thought I’d give you the opportunity to see 2 small but beautiful objects closer than you can in the galleries. 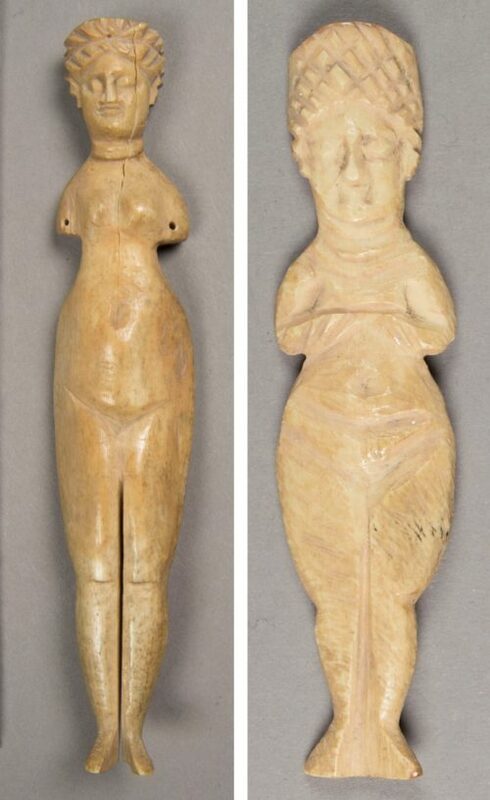 These 2 female figures, both excavated from Nippur, Iraq, will be on display in the same case in the Middle East Galleries. They’re small, just several inches long. The figure on the left was likely a doll which would have had articulated arms; you can see the holes where they were once attached. Fortunately, both artifacts required very little treatment. B8997, the figure on the left, does have a large, but stable crack that did not require any treatment. Examination under the binocular microscope revealed small amounts of burial dirt on both figures which had escaped previous cleaning campaigns, so both were carefully surface cleaned to remove this soil. As I worked on these figures, I captured some images with the camera attachment on our Leica microscope. 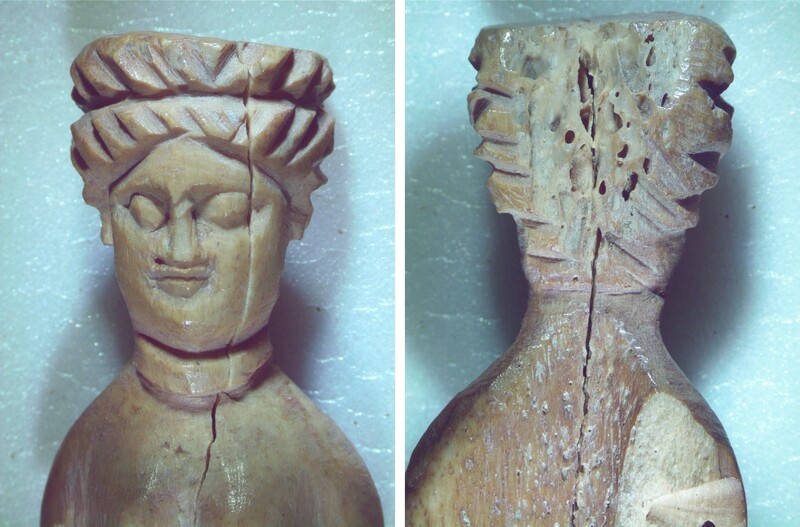 Both objects are made of bone and are delicately carved. The reverse side of the doll’s head has an unworked area that nicely shows the cancellous (or spongy) bone features. Their time in the lab was brief – they only stayed for a day or 2. But in the midst of the hustle and bustle of preparing for these galleries, it’s nice to take a moment to appreciate the details. The Middle East Galleries open to the public on Saturday, April 21. Our department has a few loose ends to wrap up with that project (and a few loose ends on the blog – stay tuned for a last blogpost on the mosaic column treatment) but we’re already turning to our next big tasks – the renovation of our Mexico & Central America Galleries, Africa Galleries, and Egyptian Galleries.